Conor O'Shea kicked two points for Breaffy last weekend when they saw off Claremorris. Photo: Sportsfile. With last weekend's meeting of Knockmore and Castlebar Mitchels postponed and Ballintubber playing only their first league game after a postponement in round one, Breaffy moved to the top of the league table early doors with their second win in a row last weekend against Claremorris. They were made to fight hard for that win, with the south Mayo men sticking with them right throughout and James Shaughnessy's 10 point haul a very impressive return. Breaffy held on to win by two points thanks to Aidan O'Shea's second half goal being the decisive score. On Sunday, they will face off against Charlestown as they look to make it three wins on the bounce. The east Mayo men had their first league encounter of the season last weekend after a round one postponement, but they were outclassed by Aghamore who had nine points to spare over Sarsfields. 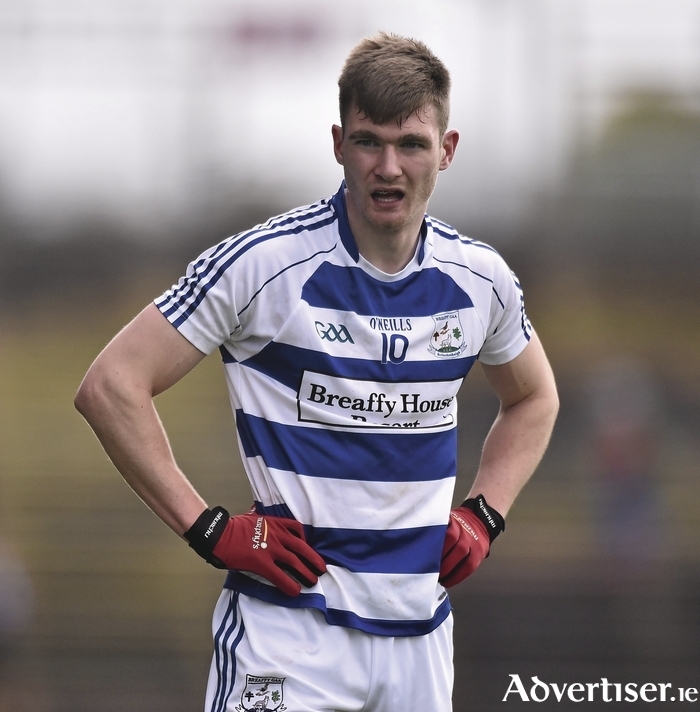 Jack Reilly top scored for Charlestown in that loss with four points, and Colm Maye chipped in with two, but they will need a much bigger showing if they are to stop Breaffy on Sunday. As for Aghamore, they bounced back from their opening day loss to the aforementioned Claremorris in style with Fergal Boland, their leading man, hitting 1-4 from play, while Alan Freeman and Conor Lyons chipped in with a brace of points each. This weekend they will take on a Crossmolina Deel Rovers side who were on the end of a bit of a clipping from Ballintubber last time out. Tom Prendergast's men ran out 3-14 to 0-10 winners over the Deel Rovers, who saw Fionan Duffy accounting for half of their scoring and Conor Loftus chipping in with two more points. Aghamore will be confident of picking up their second win on the bounce, but the Deel Rovers men are more than capable of taking the points too in this one. Ballintubber will go looking for their second win in the league on Sunday when they host Davitts in the Ballintubber Resource Centre pitch. Last weekend Cillian O'Connor kicked 2-4 for his side, Jason Gibbons, Alan Dillon, and Danny Geraghty also getting in on the scoring act. However the performance of Stephen O'Malley was one that stood out more than most as he scored 1-4 from play over the hour. Davitts come into this game on the back of a tight, hard fought, win over Hollymount-Carramore in a south Mayo derby, with Evan Ronanae their leading marksman kicking four of his side's nine points in this victory. Having tasted defeat in round one, the win over their local rivals is something that Davitts will have enjoyed, but they face a much tougher test this weekend when they travel to west Mayo. Hollymount-Carramore will head north on Sunday where they will take on a Knockmore side who had a weekend off after the postponement of their meeting with Castlebar Mitchels due to a bereavement. Having lost their opening two games, they could badly do with a win in this one, but it is going to be a tough ask and Conor Keane, Darren Coen, et al, will need to have their shooting boots with them. The Mitchels will face a Garrymore side who looked to have the points wrapped up last weekend against Ballaghaderreen who trailed by nine points before hitting 2-3 down the home stretch to grab a point with Michael Tyrrell and Sean McHugh netting the goals and Shairoze Akram kicking the equalising score. That will be a hard one for Garrymore to stomach and facing the county champions is not an easy way to bounce back. As for Ballaghaderreen they will look to go one better and pick up their first win of the league season when they take on Claremorris at home on Sunday afternoon. Page generated in 0.0650 seconds.